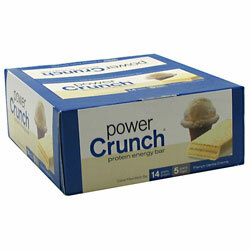 High Protein Creme Filled Wafer. Made with Proto Whey Protein; Proto Whey is a revolutionary new form of dietary protein. It's Micro Peptides are designed exactly to specifications of human metabolism (dieting, muscle repair and growth, energy, and immune response). Proto Whey Protein Blend [Proto Whey (Micro Peptides from Extreme Hydrolyzed Whey Protein [55% di and tri peptides], Maltodextrin, Sucralose], whey protein isolate, micellar casein), palm oil, enriched flour (wheat flour, malted barley flour, niacin, reduced iron, thiamine mononitrate, riboflavin, folic acid), sugar, palm kernel oil, dextrose, soy lecithin, natural flavors, sucralose, salt, baking soda. Ingredients: Proto Whey Protein Blend [Proto Whey (Micro Peptides from Extreme Hydrolyzed Whey Protein [55% di and tri peptides], Maltodextrin, Sucralose], whey protein isolate, micellar casein), palm oil, enriched flour (wheat flour, malted barley flour, niacin, reduced iron, thiamine mononitrate, riboflavin, folic acid), sugar, palm kernel oil, dextrose, soy lecithin, natural flavors, sucralose, salt, baking soda.